Are you a fan of Real Time with Bill Maher? Recently, HBO announced the TV series’ 16th season begins this Friday, January 19th. Hosted by Maher, the talk show features a roundtable of public figures who discuss and debate current events. The season 16 premiere will feature author Michael Wolff, activist Saru Jayaraman, journalist Andrew Sullivan, and comedian Larry Wilmore. The new season of Real Time with Bill Maher premieres on HBO on January 19th at 10 p.m. ET/PT. REAL TIME WITH BILL MAHER returns for its 16th season FRIDAY, JAN. 19 (10:00-11:00 p.m. live ET/tape-delayed PT), with a replay at 12:30 a.m., exclusively on HBO. 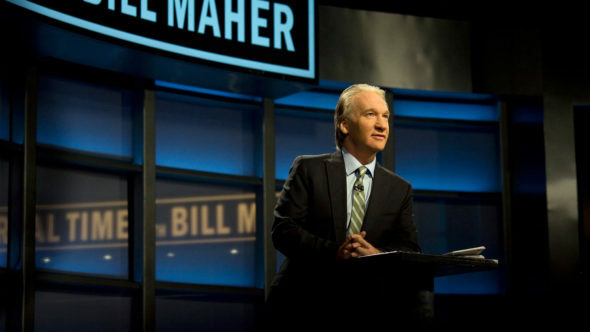 Allowing Maher to offer his unique perspective on contemporary issues, the show includes an opening monologue, roundtable discussions with panelists and interviews with guests. Author Michael Wolff is the top-of-show interview guest. Activist Saru Jayaraman is the mid-show interview guest. The roundtable guests are journalist Andrew Sullivan and comedian Larry Wilmore. What do you think? Do you watch Real Time with Bill Maher? Will you watch the new season? More about: HBO TV shows: canceled or renewed?, Real Time with Bill Maher, Real Time with Bill Maher: canceled or renewed? I only get HBO because of Bill’s show. He is hilarious and one of the only people who say what we are all thinking. My husband and I only have HBO because of Bill Maher. His show is Great and he has multiple excellent guest speakers and panelist each week. He is off the air now for the summer and I am looking forward to his return in fall because we miss him and all his guest speakers, terribly. Especially in these terrible, turbulent political times. I totally agree! I hate paying for HBO because Bill’s show is the only thing I ever watch on there, but I HAVE to watch it and I miss him so much when he is on hiatus! Like his show…but I think he has lost focus on the issues…stop giving free press to trump about what he should do…knowing he is not…especially that comment about Black Panther movie…I think he has not learned his lesson…I may stop watching even though i want to hear the jokes. Bill is a great debater and looks for truth. I don’t always agree with him. His show is at least healthly and sane and I sure do miss him when he is away.